From drones to VR, off-the-shelf technologies offer personalisation, scalability and a universe of possibility for building brand experience. Disruptive innovation, the term used for technological advances which involve the internet of things, artificial intelligence and big data, has been making inroads into the advertising industry. In addition, technologies such as machine learning and AI modules, which until several years ago were only available to a small number of experts, have become widely and reasonably available and are being applied in various ways. My vote for the two top disruptive technologies in the communications domain would go to drones and virtual reality. As everyone jumps on the 'brand experience' bandwagon, the ability of drones and VR to expand the limits of the real world will be central to the technology which propels the future of brand experience. While the technology is still new, strong case studies are already building up. Taking a look at some of those cases will help us understand the new concepts needed to build upcoming brand experiences. In this case, the use of a drone instead of a radio-operated helicopter gave it the eerie, other-worldly feel which succeeded in catching many a pedestrian’s eye by looking as though they were being invaded by aliens. Even though we see blimp ads from time to time here in Tokyo, planes and blimps feel too familiar and do not feel as unusual or jarring. The freely floating objects just above the ground cannot help but catch your attention. In this case, the drone helped create not just one type of an aerial ad, but a distinctive brand experience. The next case holds out the promise of information media delivered suspended in mid-air. SkyMagic, recently launched by MicroAd, uses 25 drones, with frames attached with 660 LED lights, flying in formation to act as a stage set (the controls are those of DMX512, the digital data transmission standard used in controlling stage lighting equipment). 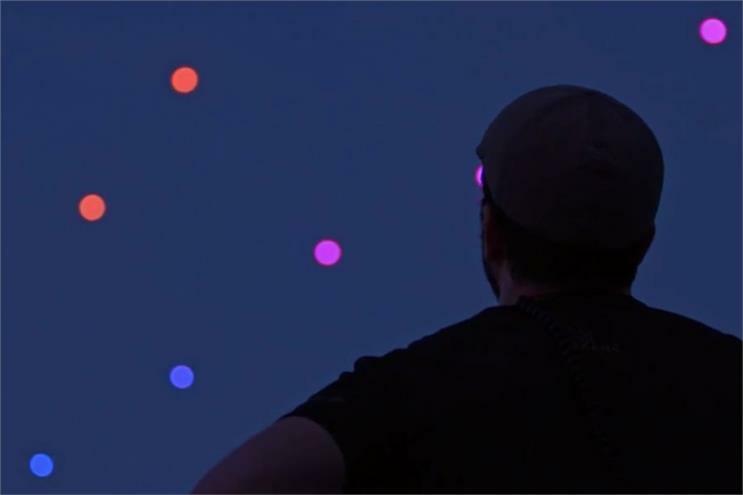 "LED lights and drones flying in formation gives the illusion of a giant object floating before your eyes," says Akio Ota, the head of development of SkyMagic project at MicroAd. "A large shining object that floats against gravity is instinctively registered by animals including humans as an alien being. This will no doubt create an extraordinary experience." This combination of LED + drones flying in formation can go beyond stage lighting but also create displays by increasing the number of formations. It is conceivable therefore that a display several hundred meters long will float above the main stadium during the 2020 Tokyo Olympics. A picture in the sky, by 100 drones: Each drone is less expressive than the SkyMagic planes, but to see 100 of them flying is astounding. It gives some credence to the flying displays possibility cited above. Drones can bring an other-worldly, alien presence to the real world, and that, without doubt, will open up possibilities for a completely new brand experience. While the architecture that forms the basis of VR was formulated in the late 1960s, it was recently that a VR goggle for Playstation was announced. In addition to Playstation, the Oculus Rift and HTC Vive were also launched this year, prompting some to call 2016 'year zero' for VR. As those who have experienced it know, a VR goggle does not show you images of another world – it is there so you can dive into that world. With a VR goggle, you can ride a rollercoaster without moving from your armchair. You know you are not on an actual rollercoaster, but your body stiffens and sweat breaks out. Many get glued to their seats. It forces an artificial control of basic human instincts. Furthermore, simple VR content can be created in a few hours, even by a beginner. I bought an Oculus Rift developer kit and without any prior knowledge and using the internet as a guide, managed to create some basic VR content in half a day. Of course, to create something with high quality, you need a great idea and professional skills. But the fact there is a developer infrastructure which allows for easy handling of advanced VR must be the reason behind its rapid proliferation. Here are some case studies in communication, of VR being used as branded entertainment. This was an event to bring to life a novel and an anime based on the same novel which deals with the topic of a VR game. A beta-testing phase which appears in the fictional material was recreated in real life, taking advantage of the novelty of the VR itself as well as building clever surroundings which imitated the novel. These elements contributed to make a big impact to the brand campaign. Since VR is about diving into another world, it is best suited to immersing the audience in a world as the brand sees it. To that end, there have been a lot of content created which serve directly as a brand "tour". This may look futuristic, but it is already on the market – though available only as a developer’s edition at $3,000 (£2,300). Unlike the VR goggle, the basis is in reality and mixed in are images and information. The objects it shows are fixed in space so that it actually looks like it is placed there. In the video, a television appears as though it is embedded into a wall, a motorbike frame has a cowl that was designed virtually, and plumbing repairs are explained remotely using arrows, among other things. As of now, it is possible to distinguish between the real and virtual objects, but it is easy to imagine the time coming when the precision will be so high that you will not see the difference. An offer like "putting a virtual box of pizza and can of beer on the table as a product placement in return for watching a free movie on a hypothetical display" can be created, even at this moment. While everyone wants to evolve from advertising to brand experience, as long as they are based on real experiences, there were many hurdles to clear including lack of control, scalability and cost. But with drones and VR (and MR) it is possible to offer something which is not real but can be experienced as reality. This technology is easier and cheaper than the real thing, can be controlled and personalised, is scalable and full of possibility to expand the brand experience. And beyond all else, there is the freedom to experiment. The time to test your imagination is now. And you will be surprised to see that new ideas for brand experiences start flowing much easier than you imagined. Hitoshi Nakagawa is head of marketing analytics at Ogilvy and Mather Japan. A version of this article first appeared on Campaign Asia-Pacific.